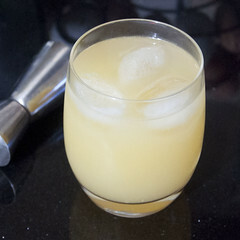 Being able to mix a decent drink is a very useful country skill – it brings a splash of sophistication to life when you don’t live somewhere where you only need to chuck a rock to hit three decent cocktail bars. Anyway, I had to share this one with you – it was suggested to me by an old school friend (who, fortunately for him, is safely on the other side of the world where I can’t hold him responsible for the consequences!) and it’s such a beautiful, fresh taste of summer, that I’ve fallen rather in love with it. Really good cloudy apple juice, the best you can get, ideally quite a crisp, dry one. In a tumbler, place three or four cubes of ice. Pour in a measure of gin (or why not a double – go on, you’ve earned it!). Now add a splash of elderflower cordial – only a little one! Finally, top up with apple juice. There, how easy was that? This is absolutely gorgeous (and one to try even if you don’t think you like gin). The apple juice is the star here, and really defines the character, so the better your apple juice, the better the cocktail (anyway, I’m sure it counts as one of your five-a-day). The elderflower adds a subtle sweetness and a gorgeous floral bouquet, and the gin just sits discretely in the background with a delicate waft of juniper and a little citrus zing. Be warned, though, it does go down very easily! A sinister thought has occurred to me, which is that it might be possible to concoct a related drink, made with Plymouth gin, Cornish cider and hedgerow elderflower cordial, and call it a ‘Westcountry Wrecker’… Some experimentation may be required! A quick bonus recipe for you this evening – scribbling this down mostly for my own reference – as I definitely intend to make this again – but also because a couple of people on Twitter and elsewhere have asked for it. This rather spanking apple and marzipan cake is adapted from an apple cake recipe in the River Cottage Handbook ‘Cakes’ volume by Pam Corbin, adjusted for my taste and available store cupboard ingredients. 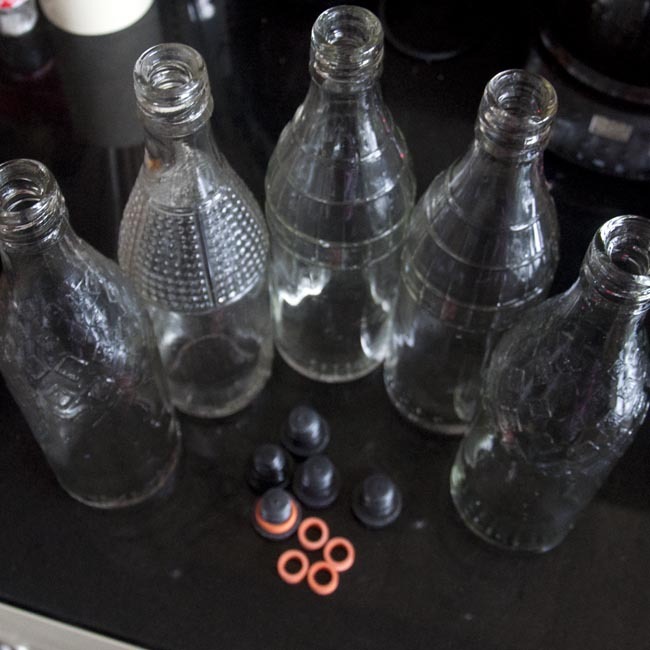 Apologies for the lack of ‘making’ photographs – this one wasn’t really for the blog at all! Two decent sized apples – cookers or eaters, whatever you have that needs eating up, I used one of each. First, set the oven to 180 C. Butter a 7″ or 8″ deep loose bottomed cake tin generously, and line the base. Combine the flour, bran, bicarb, spices and salt in a large mixing bowl. The recipe called for a mix of white and wholemeal self raising flours, but I only had white so I made up the volume with a little bran, which after all is the stuff that you sift out to turn wholemeal flour into white flour in the first place! The spice mix is to my taste – cinnamon would be very traditional with apples, but Hubby doesn’t like it. The recipe called for ground cloves, but I find them medicinal-tasting and a bit overwhelming, so follow your inclination! Chop up the softened butter roughly and rub it through the flour mixture with your fingers until it’s the consistency of breadcrumbs. Now mix in the soft brown sugar. Peel & core your two apples (if they’re lovely freshly picked home-grown apples, you might consider leaving the skins on – but these had been stored a while, and looked it!) and chop them into dice about 1cm to a side, and do the same with the marzipan. Mix these cubes into the dry ingredients. Beat your egg with a fork and mix in the milk. 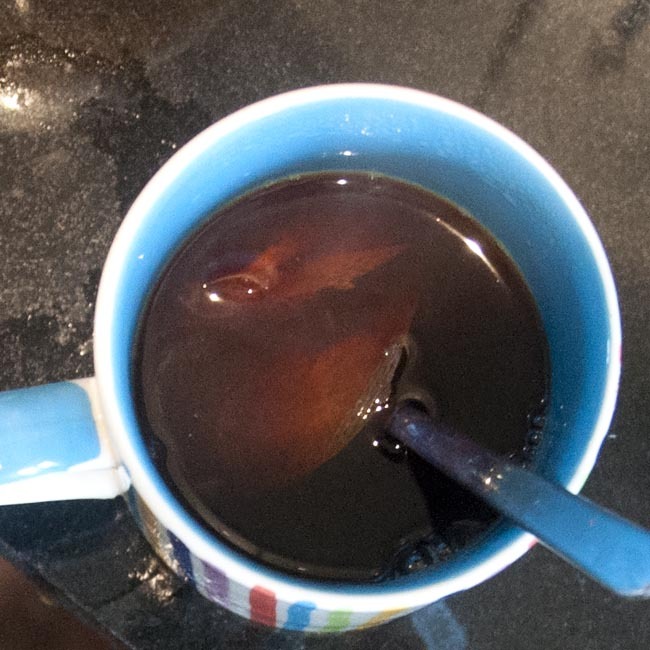 Add this liquid to the rest of the ingredients in the bowl. It won’t look like there’s enough – but if you keep moving the contents of the bowl around, eventually all the dry ingredients will combine with the liquids to form a rough batter. It won’t look like there’s enough ‘cake mix’ for the diced apple, either, but don’t let this bother you too much. Spoon the mix into a deep sided cake tin – something like a 7″ or 8″ tin you’d make a Christmas cake in, rather than a sponge tin. Level the mix as well as you can. Now take your extra apple and core it, leaving the skin on. Slice reasonably thinly and arrange the slices over the top of the cake to decorate. Sprinkle over some sliced almonds. Finally, dust the top of the cake with a tablespoon of granulated sugar. Pop it into the oven (turning if necessary to keep the cooking even) for about 45 minutes, then check to see if a skewer comes out clean. Mine actually needed about an hour in all to cook through. The batter, implausible as it might seem, will have managed to step up to the mark, and it will look like a nicely risen cake, rather than the chunky mess that went into the oven. Leave the cake in the tin for about half an hour after it comes out of the oven (it’s quite a crumbly texture and I suspect it would just fall apart if you took it out straight away) then ease it out of the tin and leave it on a wire rack to cool completely. It will then keep in an airtight cake tin for longer than it’ll take you to eat it (2-3 days, easily). I love this cake! With nutmeg the dominant spice, it’s not over-sweet, has lots going on in the texture department, and is a very ‘grown-up’ sort of treat (though I’m quite sure that kids would love it too)! The marzipan adds lovely gooey sugary melty bits, which I just adore, while the texture of the rest of the cake is nice and light. The granulated sugar, apple slices and almonds add a lovely appearance to the top, too; and it’s a ‘self-decorating’ cake, which is a bonus – it comes out of the oven ready to go, which is a great time saver. And it looks utterly mouthwatering, which is even better! Hubby loves this, and I think you will to – so give it a try. Make yourself a nice cup of tea, and tuck in! Foraging Skills – how to get ahead! I’ve been thinking about foraging recently. There’s very little quite as special as a lovely – and free! – treat garnered from a hedge. I’m thinking about a wild mushroom risotto, pots of crab apple jelly, a steaming blackberry crumble or a bubbling demijohn of rosehip wine. Foraging is really an autumn sport, though, borne from the season of mists and mellow fruitfulness, so why am I writing about it now? The thing that makes a really good forager isn’t being able to spot a laden crab apple tree at three hundred paces – it’s knowing where that tree is in the first place. 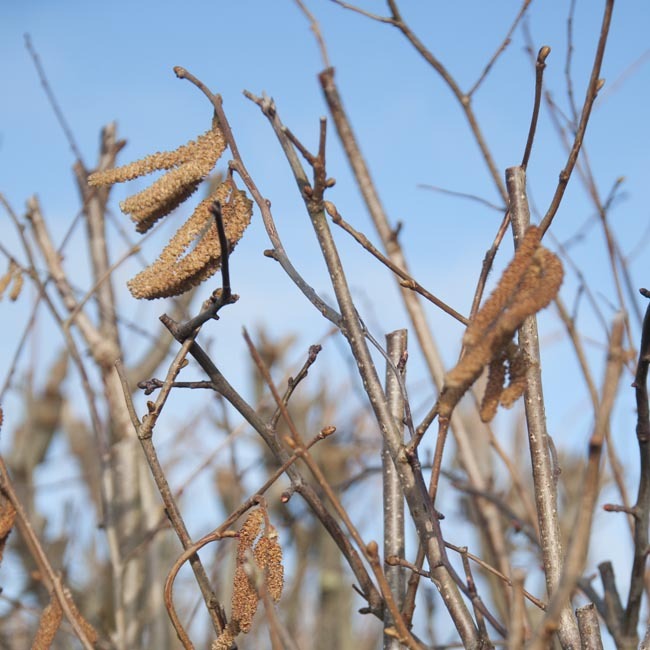 Being a successful forager depends on keeping your eyes open all year round – if you notice things now, and remember them, you’re well on target for a bumper summer and autumn foraging season. They’re hazel catkins, and where they’re hanging in profusion from the naked branches of hedges and shrubby trees now, there should be some lovely cob nuts in the autumn – they’ll be much harder to see then, when there are leaves on the tree, and hazels growing in mixed planting aren’t especially distinctive looking. Watch like a hawk though, come autumn, and pick them slightly green and sweet – because the mice will want them too! A little note on the legality of foraging – if the item is being grown as a crop, then it’s not foraging, it’s scrumping (or stealing!). It’s very unlikely that cob nuts or blackberries growing in a field hedge are intended as a food crop, but the nuts and sloes in my garden hedge definitely are! So if it looks like someone’s caring for a tree or a hedge, it’s in an orchard or garden or looks intentionally planted, tread with care! That said, there at lots of edible crops grown incidentally on trees planted ornamentally, on streets and in council amenity spaces, particularly in urban areas – foraging doesn’t have to be just a country pursuit! – look out for apples, plums and cherries, too! 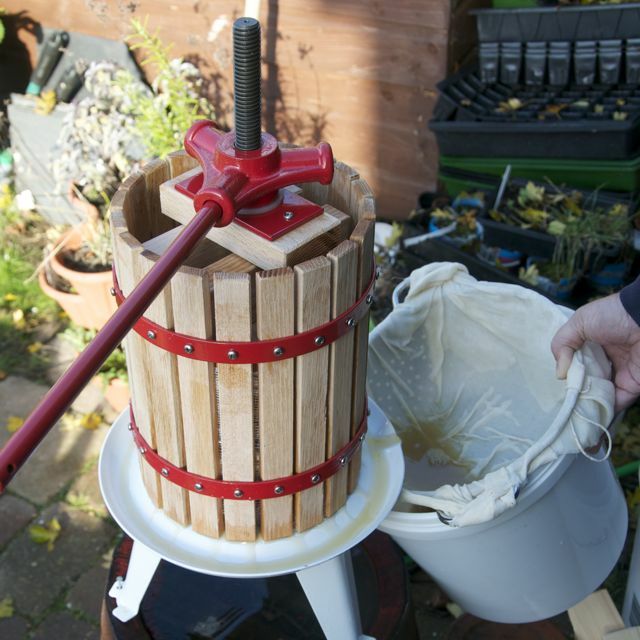 On a lovely bright November weekend, I pressed a load of apples for cider-making. 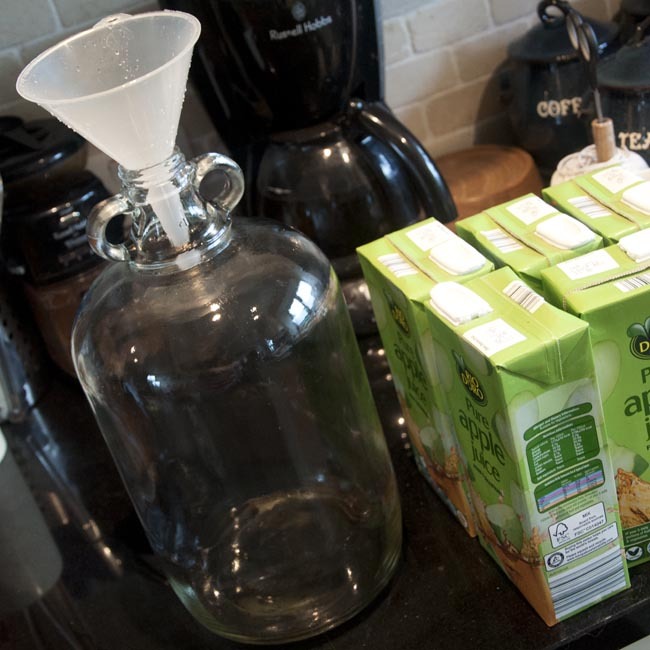 Enough demijohns (plus stoppers and airlocks) to contain the volume of apple juice you’ve collected. All my demijohns have come from Freecycle, so it’s worth keeping your eyes open. For recommendations of UK homebewing equipment suppliers, see the suppliers list. 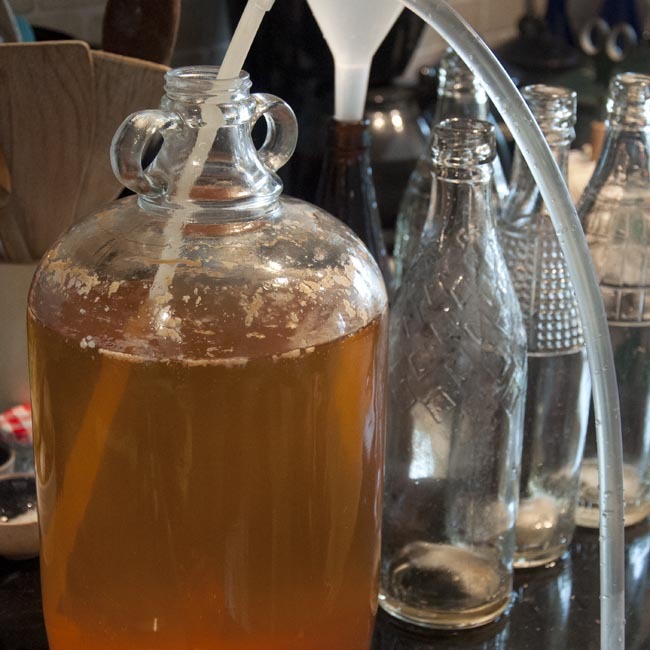 Now, time to turn your wonderful juice into cider (for any Americans who might be reading, we mean hard cider – the traditional alcoholic sort). Traditional ‘real cider’ makers would do nothing with it at this stage, and wait for the natural yeasts which you hope are already present on the apples to do their job and get fermenting. 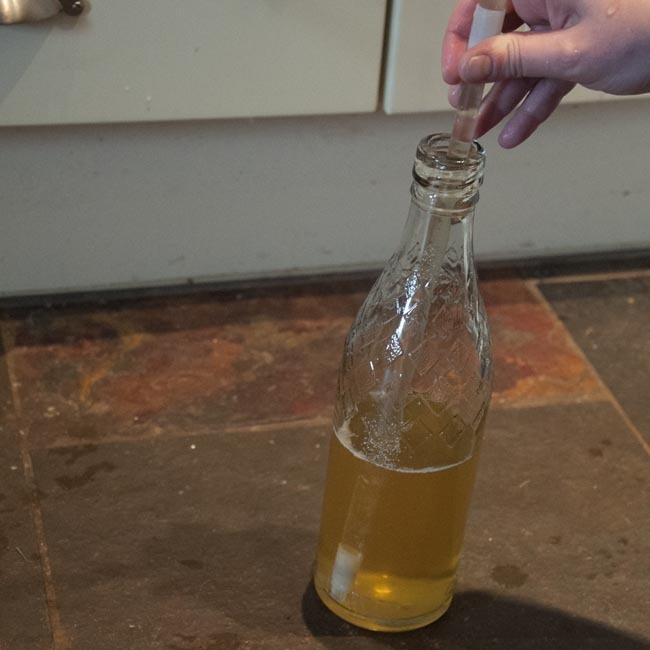 There is an alternative approach which involves using campden (sulphite) tablets to kill off the wild yeasts and then adding some wine or cider yeast of your own, which with any luck should guaranteed a ‘clean’ culture of your chosen yeast strain. 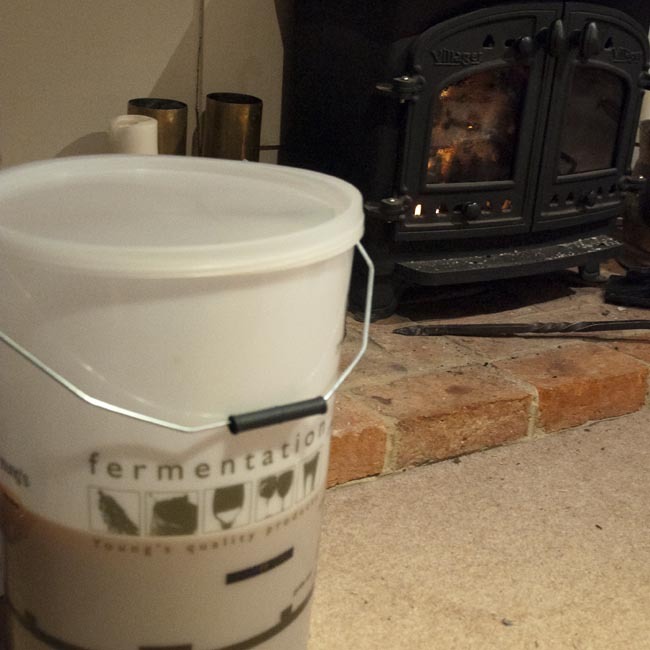 I decided to go a third route, didn’t use any campden, but did add wine yeast and yeast nutrient to give the process a ‘kick-start’ and make sure that an appropriate culture was at least in there with a fighting chance! 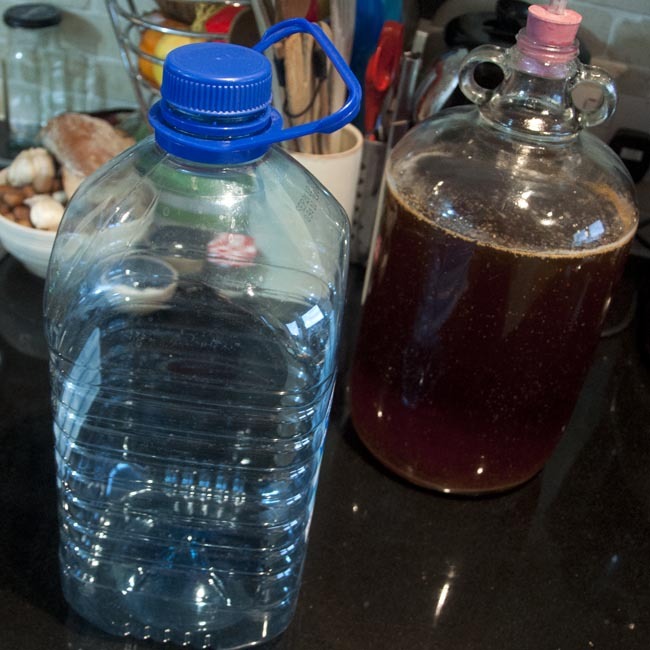 You should probably take the specific gravity of your apple juice before you start fermenting, as this will tell you something quite important – with a bit of arithmetic (or there are online SG to ABV calculators out there you could avail yourself of) you should be able to work out how alcoholic your cider ends up. This is relevant both for keeping your driving licence, and for making sure your cider contains enough sugar, and therefore after fermentation, enough alcohol, to keep well. You’re aiming for a minimum of about 3.5% ABV, real ciders can easily get up to about 8%. I didn’t test my juice (do as I say not as I do, right? ), but it tasted nice and sweet so I think it’s likely my cider is about the 6% mark. Invest in a glass hydrometer (they’re cheap, easy to use with a bit of practice, and ever such pretty bits of old-fashioned looking laboratory glassware), you won’t regret it! 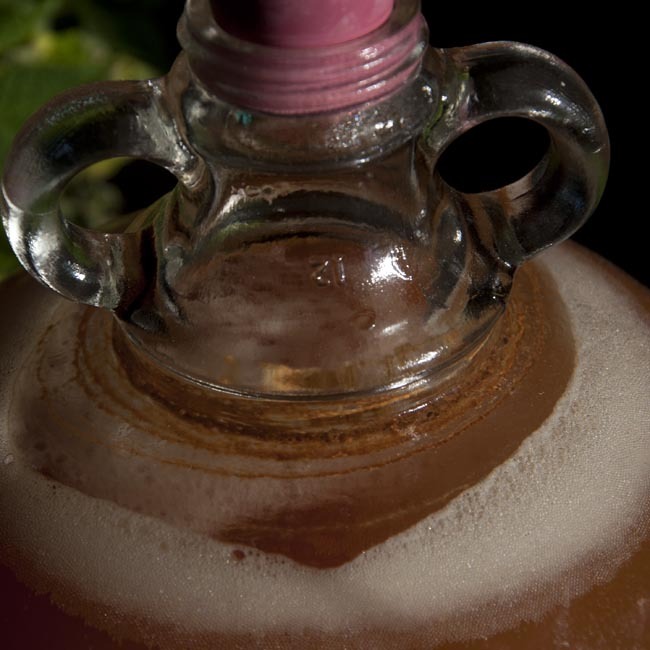 There is lots of advice that you should ferment your cider under lock. I didn’t have an airlock capable bucket available so just kept the lid loosely on. 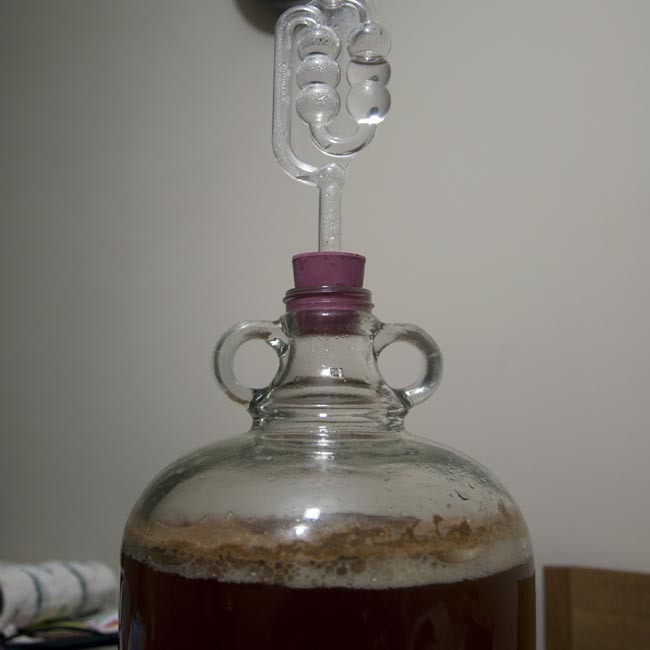 My experience from beer brewing is that the CO2 produced during fermentation will give a good blanket over the brewing liquor, being heavier than air, and oxidation shouldn’t be a problem at this stage as long as you don’t disturb the fermenting juice. 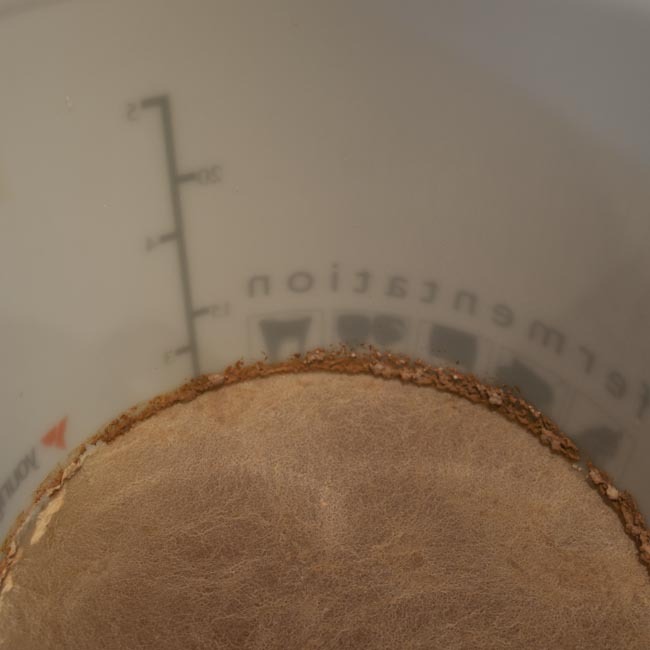 If your bucket does have an airlock, after adding the yeast and nutrient close the lid tightly and set up the airlock. If it doesn’t, just fit the lid loosely so that the gas produced during fermentation will be able to escape without blowing the lid off! Put your bucket in a nice warm place and try to avoid peeping. Mine went by the fire in the living room for the first few days, as we were having a bit of a cold-snap. 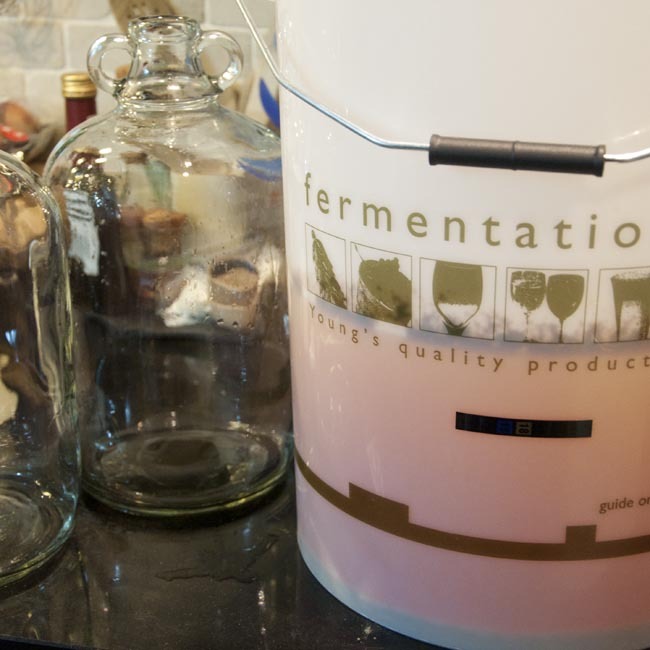 You’ll be able to tell fermentation has started when you see bubbles through your airlock, or when a nice loose foam starts to form on top of your apple juice (because you’re not peeping, right?). 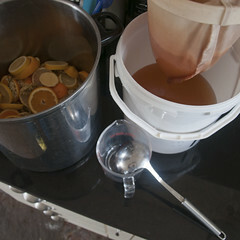 During fermentation, the dead yeast and quite a bit of the solids from the apple juice will settle out in the bottom of the bucket, and the colour of the juice changes from brown to a yellow-orange. In general, the cider will not clear completely, but it will be brighter than it was before. Once fermentation seems to have stopped (I gave mine a generous month), you’ll have a nice thick layer of debris on the bottom of the bucket with cider above it. Now it’s time to ‘rack’ the cider into demijohns for bulk conditioning. 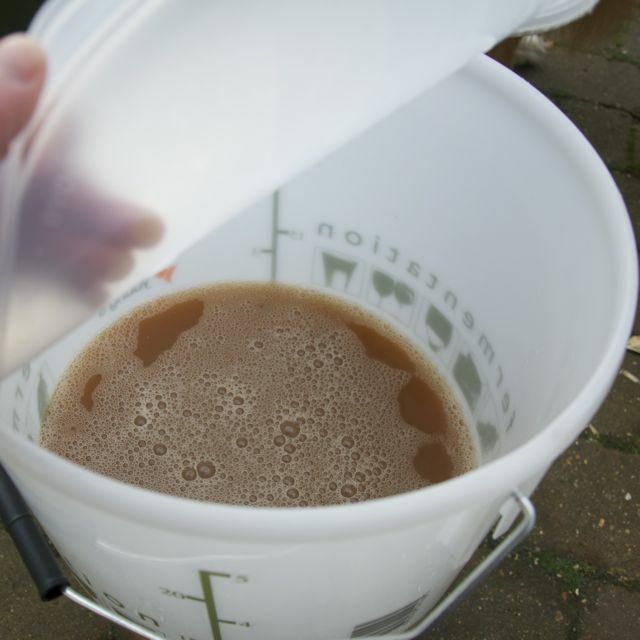 When I opened the bucket, I found rather an alarming-looking layer of yeast floating on the surface of the cider. I can only assume that this was a wild, top-fermenting yeast strain, as it seems to have done nothing awful to the cider so far! Clean and sterilise your equipment (demijohns, syphon, stoppers & airlocks) carefully this time, following the directions on your steriliser. Now the cider has fermented you risk accidentally making cider vinegar if acetobacter bacteria were to get in. 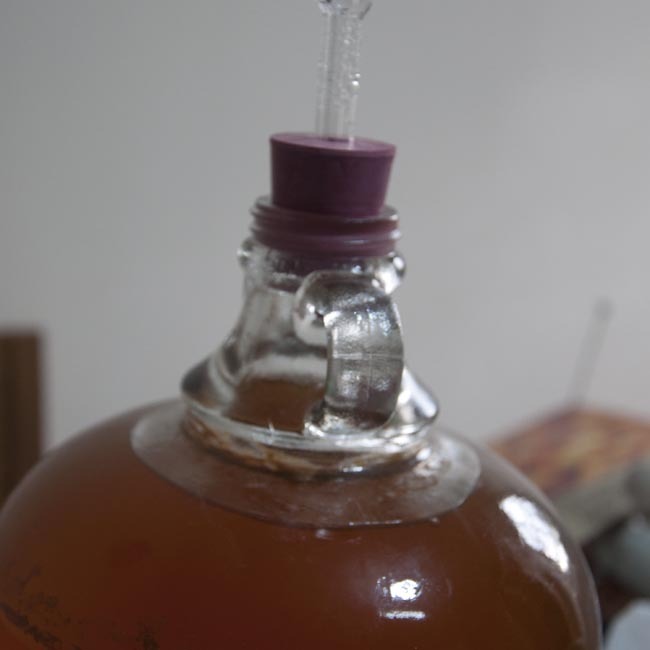 It’s also important to avoid introducing oxygen into the cider at this stage – acetobacter need oxygen to make vinegar from alcohol, so even if there’s some contamination they’ll struggle to get going if the cider stays free of air. Syphon carefully, keeping the outlet of the syphon below the level of the liquid and avoiding introducing bubbles. 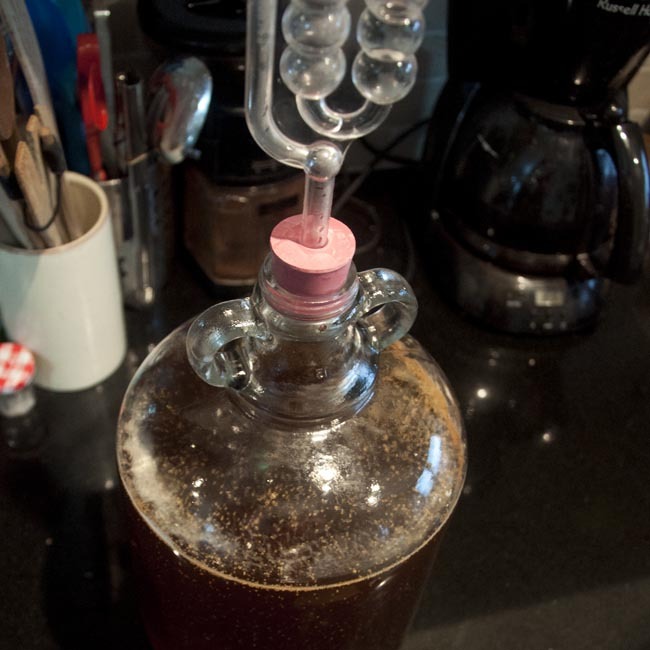 Then fit your stoppers and airlocks and put the cider in a cool dark place to mature for a few months before bottling. Keep an occasional eye on your airlocks to make sure they’re not drying out. I expect to leave mine in the demijohns until spring, and will then bottle into champagne bottles with a bit of priming sugar to make sparkling cider. 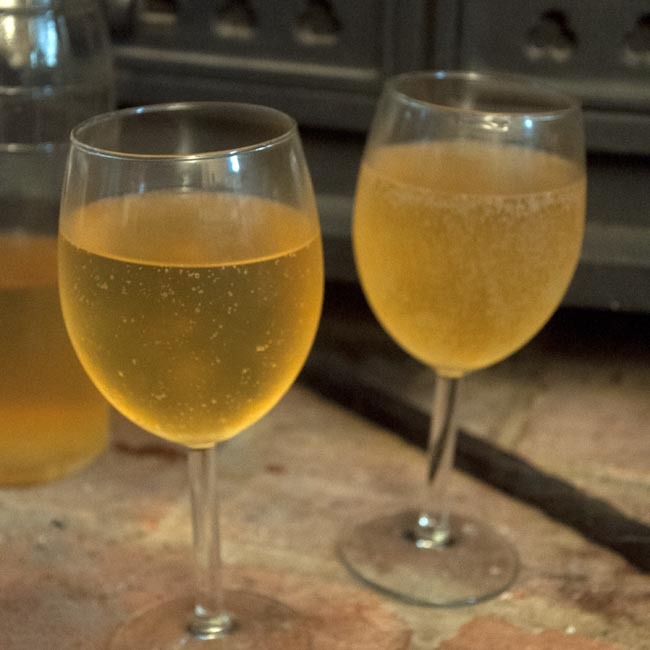 We had a couple of pints more cider than fitted in the demijohns, and it would have been inconceivable to waste it – I can report that it is, already at this stage, definitely cider. It’s a bit rough around the edges with quite a hard tannin that hopefully will mellow a bit with maturation, but has a lovely fresh apple aroma and definitely shows promise! If you’re going to try it, I would recommend having a bit more of a read about the process before you start. Some of my favourite books on home-brewing are listed in the library. And if all that seems a bit complicated and labour-intensive, I’ll give you my directions for the quickest and easiest (and remarkably tasty!) 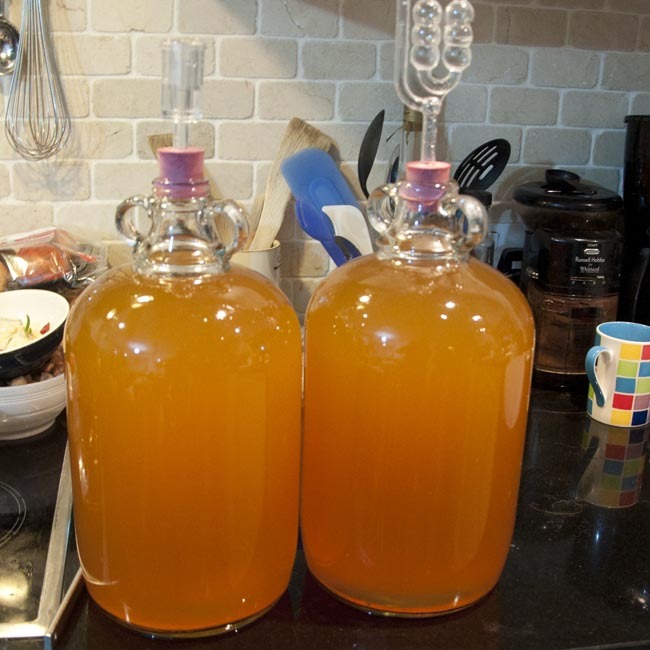 home-brewed cider in the world very soon! At the end of October, a lovely holiday in Cornwall yielded an unexpected bonus – three sacks of apples from the orchard where we stayed. 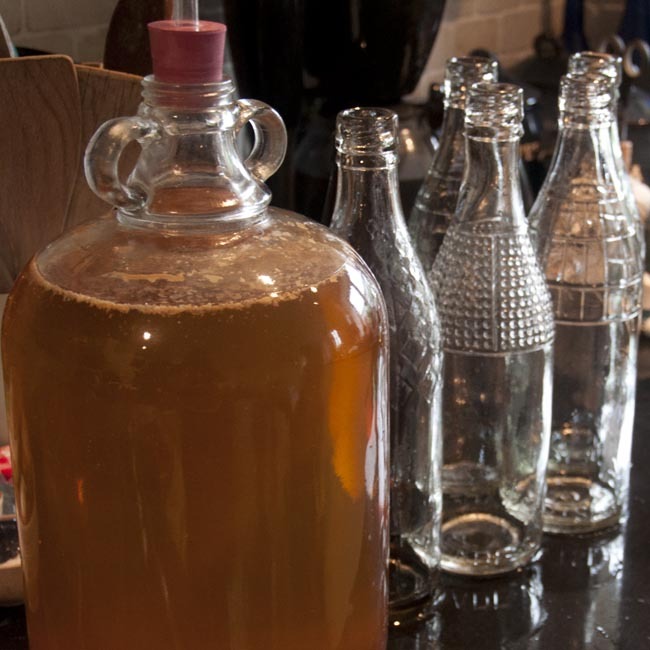 There was only one thing to do – make cider! 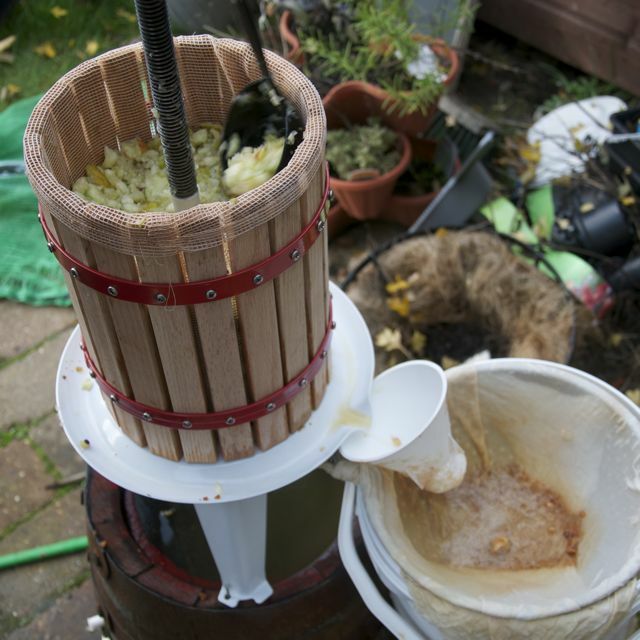 Only one problem – I didn’t have a cider press. We’ve been faffing about building one for the last couple of years, but hadn’t got round to it. A bit of pleading and cajoling later, and I’d managed to score a brand new apple press for an early Christmas present – what a result! Of course, apples don’t just press themselves. 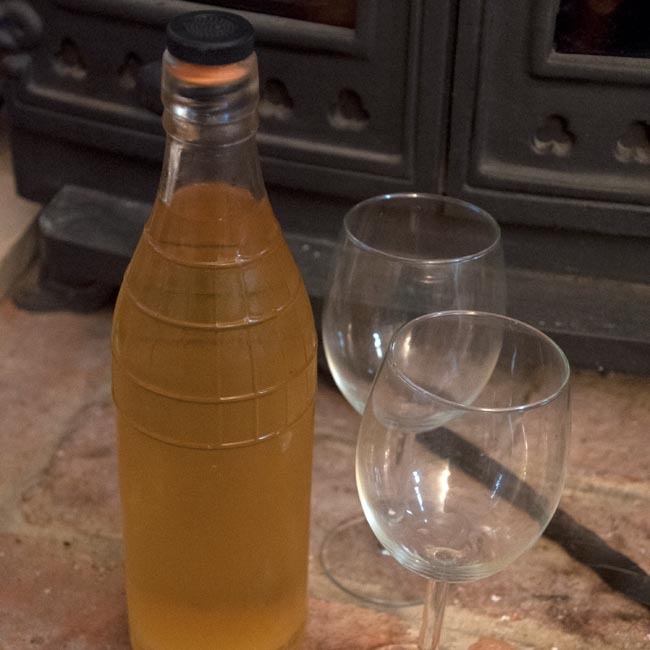 Real cider making – unlike most of the country skills in this blog – is time consuming (and good exercise!). Set aside a nice sunny autumn day, and if you can talk some friends into coming around to help, so much the better. 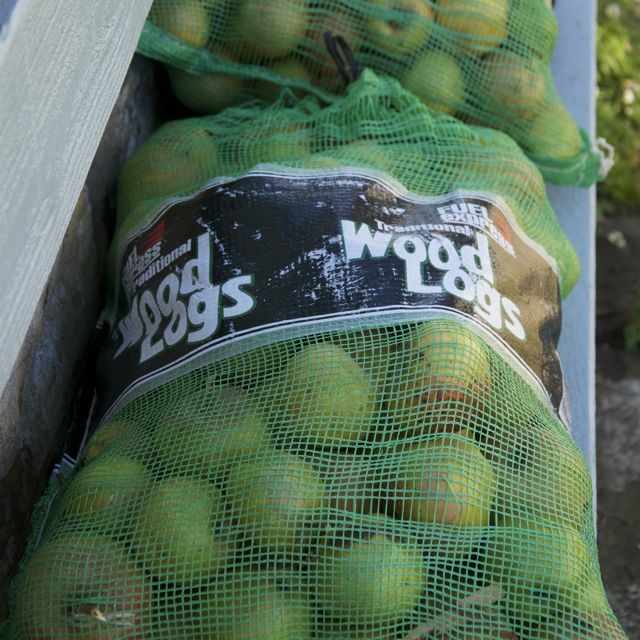 For an idea of how much apple juice you’re likely to produce, we got a yield of just over a gallon per bag of apples – the bags are the sort you buy logs in. It’s possible that with more practice and different equipment we may have done slightly better, but I doubt there was much waste. A quick note on sterility, first. 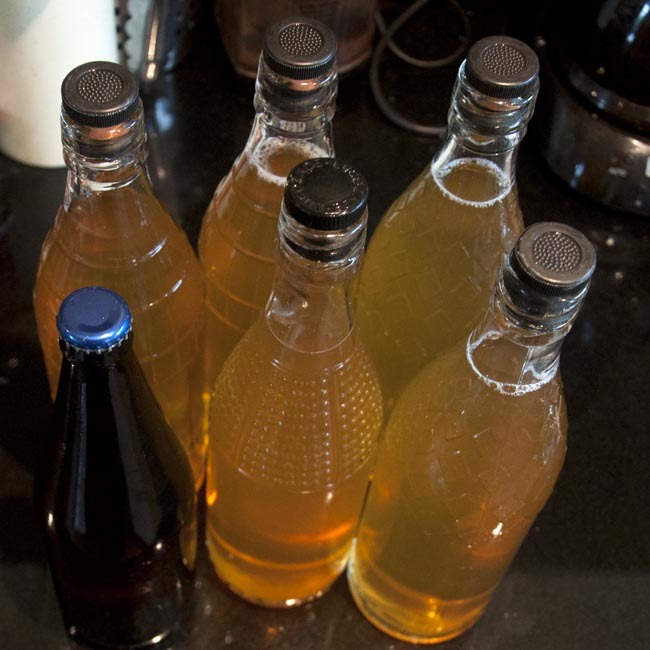 Home-brewers are obsessed with sterilising things. I am not washing my apples in camden to kill off wild yeasts, my ingredients (the apples) and tools (wooden equipment and press components) will not be sterile. But do wash everything very carefully in hot soapy water (not the apples, obviously), and rinse them carefully before using. There is general advice to avoid metal tools and receptacles when cider pressing – we used a metal bin for crushing in the absence of any alternative – it was enamelled and in good condition, and does not appear to have caused any obvious problems, I suspect because the apples and juice were not in contact with it for very long. If you have time (and let’s face it, if you’re planning for next year, time is on your side!) there are various plans for DIY presses on the internet, or have a look at some old-fashionned presses, they’re quite simple things really. I was going to build something using a car jack for the pressing mechanism. My lovely bought press has a 6l capacity which seems about right for domestic production – the bottleneck on our two-man production process was the crushing stage. 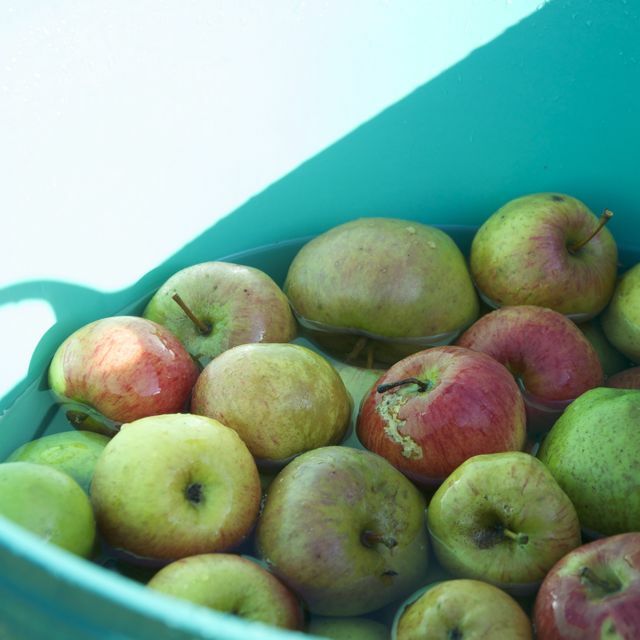 Start by washing your apples in the big bucket, you can do this quite a large batch at a time. 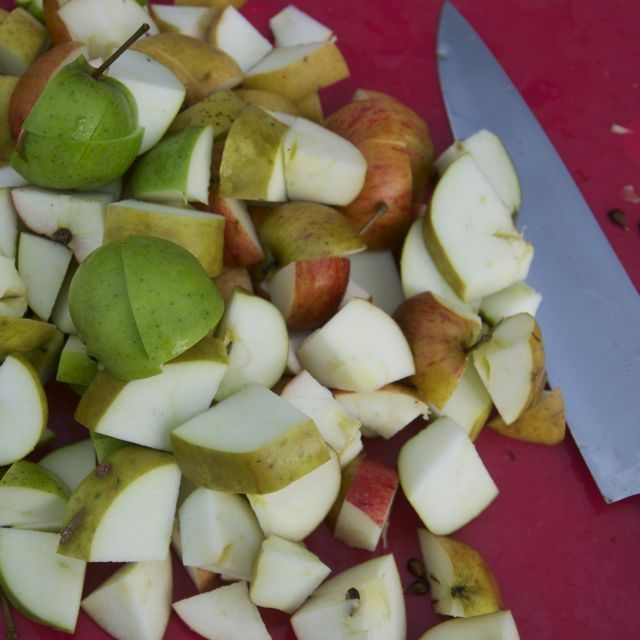 Then slice the apples up into quarters or eighths, discarding any obviously bruised or damaged areas. Transfer these a batch at a time into your crushing bucket. 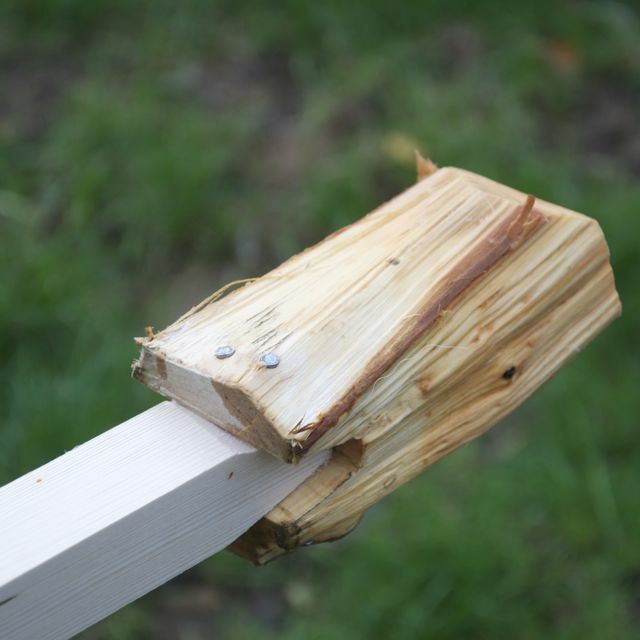 To crush you could use something like a new clean round-section piece of timber, we bodged a crusher together out of a small piece of inch-square timber we had and a plum-wood log, trimmed and stripped of it’s bark and formed into a blunt wedge at the end. 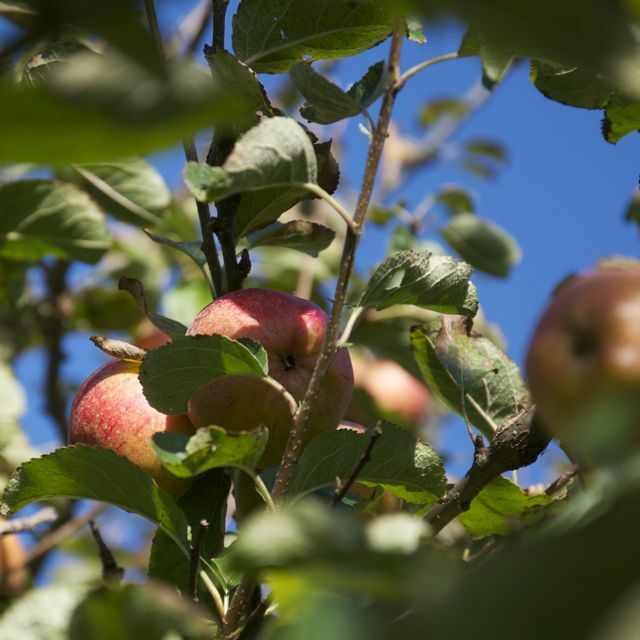 Avoid using anything which has been treated with timber preservative as it will be in intimate contact with your apples. Make sure the pole is long enough that you can use it in a comfortable standing position above your bucket, or you’ll hurt your back and shoulders. Now crush your apples to a rough pulp, until they’re making a wet squelching noise when the pole goes down and there’s just some free juice in the mixture. The aim is to make it easy to extract the best juice yield you can from your precious apple harvest, so do put in the effort here, our first batch was definitely under-crushed and we got much less juice from this than from subsequent ones. Now load up your press. Mine has a mashing bag to retain most of the solids within the press, some will use muslin cheeses or other approaches. Once the press is loaded, apply pressure slowly, building it up over a few minutes, rather than trying to get the press as tight as possible straight away. Collect your juice into a bucket through a muslin to take more of the solids out. 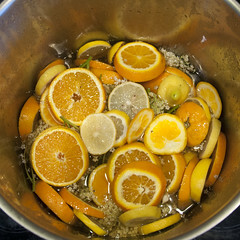 It’s ok to taste some juice at this stage (and it should taste absolutely awesome!). It will look… well, dirty brown coloured, probably. This is a result of being hardly-filtered, and the tannins in the apple juice reacting with oxygen. Don’t worry about this. 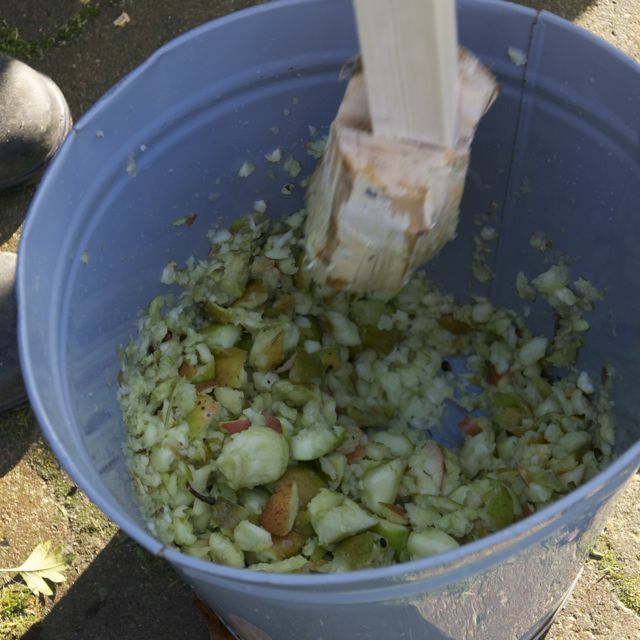 The leftover apple pulp (‘pommace’) can be fed to livestock, or composted. My hens loved it, but be careful not to overdo it. The rest can be composted. At some point you will run out of daylight, apples, or energy. At this stage you’re done. Admire the juicy product of your labours. At the moment you have unprocessed, unfiltered, unpasteurised apple juice. Smells marvellous, looks decidedly suspect. Next time, we make the juice into cider – that’s proper, ‘hard cider’ to any Americans reading!